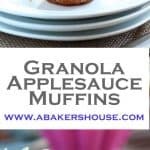 Granola applesauce muffins use applesauce instead of oil in this Whole Foods recipe. 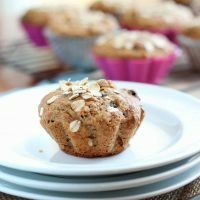 Taking small steps towards healthier choices starts with breakfast and you might as well start with a muffin! New year, new you? Well, that is how the saying goes but it is hard to put new habits into practice sometimes. I like to start with baby steps. No, I am not going to cut out baked goods (a life without cake? I don’t think so!) but, yes, here and there I can make a conscious effort for a healthier version. Today I am taking Whole Foods Market’s advice and starting with this easy change: use applesauce instead of oil in recipes for some muffins, cakes and cookies. 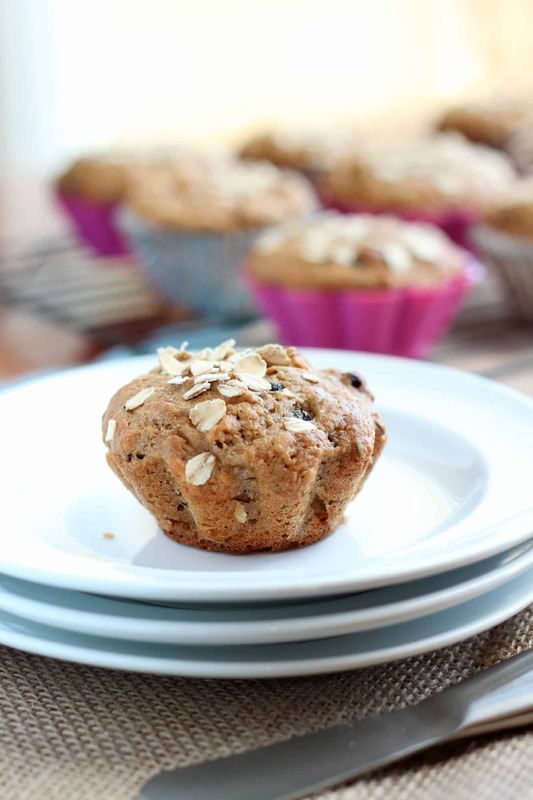 These muffins are made with a combination of granola, whole wheat flour and all purpose flour. Applesauce keeps these morning muffins sweet and moist while you can add other textures likes raisins, dried cranberries or dried blueberries for a new twist. (Yes, there is 1/4 cup brown sugar in the ingredient list but for 18 muffins that does not amount to a lot of sugar per serving– remember I am taking baby steps!!) Next time I plan to leave the sugar out completely and I doubt I’ll miss it. Pour granola into a large mixing bowl. Break up any large pieces of granola-- I like to firmly pat on the granola with the bottom of a metal measuring cup. Add the all purpose flour, whole wheat flour, flax seed, baking powder and baking soda. Add the wet ingredients to the dry and stir until just combined. Fill muffin tins 2/3 full. I use a 1/4 cup measuring cup to fill each muffin cup evenly. Sprinkle oats on top. Bake for 20 -22 minutes. Whole Foods welcomes you to take steps towards a healthier lifestyle by taking just one step at a time. Small choices can add up to make a big impact on your daily nutrition. #WholeFoods generously is offering one reader a $25 gift card to start your New Year shopping out in the right direction. Please enter the Rafflecopter below for your chance to win. The giveaway has ended. These sound healthy and delicious. This is what I should be eating instead of the Pop Tart that I had this morning on the way to work. I have a weak spot for Pop Tarts too– with sprinkles and icing of course! I am drinking more water and less soda. More water and less soda is a great way to start out the year on a healthy path. All the best to you in 2015! I am trying to drink more water!! !